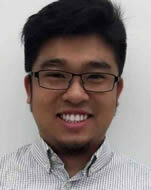 Third-year University of Houston Law Center and University of Calgary Faculty of Law student Fred Zheng. June 29, 2017 — As a student in the dual degree program of the University of Houston Law Center and University of Calgary Faculty of Law, Fred Zheng's pursuit of a legal education will send him across North America. With a summer internship at Norton Rose Fulbright set to begin July 10, Zheng's path will also take him to his hometown of Beijing. "I'm very excited to go home after two years of law school," Zheng said. "I'm really excited about my experience in China this summer. It'll be a great asset on my resume. What I really want to do in the future is work at an international firm in Asia. That's an ideal goal for me"
Zheng expects to be involved in a general corporate law setting. He said he wasn't sure in which area of law he wanted to practice until recently working at the Law Center's Transactional Law Clinic with Professor Chris Heard. "It was a really great experience," he said. "Professor Heard is a brilliant professor, and the work itself is interesting." Zheng's time in Beijing will conclude at the end of August. He recently finished his 2L year at the Law Center. As part of the dual degree program, he will complete his legal education in two years at the University of Calgary Faculty of Law. While Zheng's goal is to practice law in China, he said the Asian legal market values experience. He hopes to gain valuable experience at a firm in North America before making an overseas transition. "I came to the Law Center because of this program," he said. "I moved to Canada when I was 16 from China. I went to high school there and then to McGill University in Montreal. I still want to work in North America first, whether it's in Canada or the U.S., and UH allows me to do that."